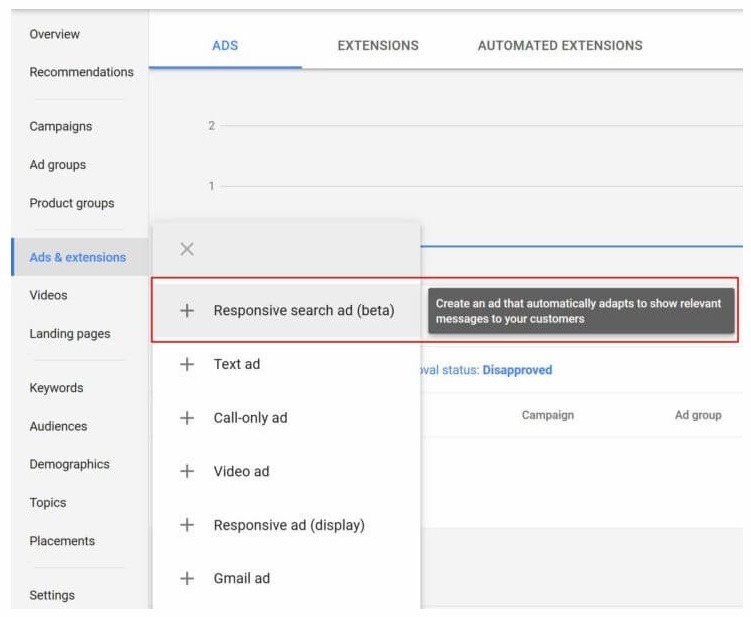 Google’s newest and most flexible ad option, Responsive Search Ads, was launched last year. Unlike traditional search ads, the trick to hacking Google Responsive Ads lies in their headline and description options. With Responsive Search Ads (RSAs), you have 15 headlines and four description input options. Google then uses arranges these options in different permutations for dynamic, unprecedented testing capabilities. 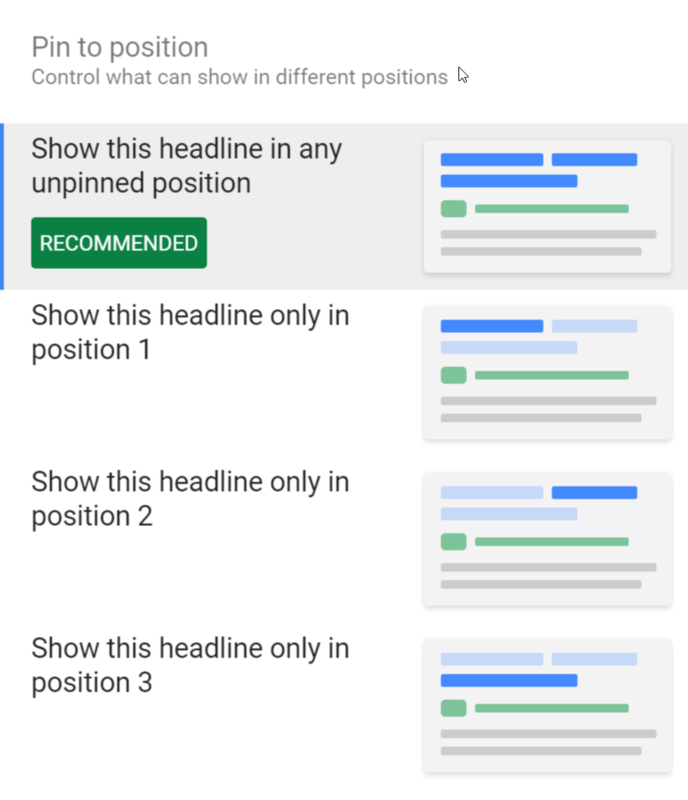 Simply put, Google will automatically and dynamically test and determine which headline/description combination works best. It does this to find the one best suited for peak performance depending on search terms, device and other triggers. Still in beta, RSAs are currently available to all advertisers in English, French, German, Spanish, Japanese, Dutch, Portuguese, Italian, Russian, Swedish, Polish, Danish, Turkish, Norwegian and select advertisers in all other languages. Before we get into the Google Responsive Search Ads hacks for maximum success, let’s look at the top benefits of using this Google campaign type and how to launch your first campaign. Improve Performance: RSAs will increase campaign performance at a group level, capturing clicks that your other campaign types may be missing. Save You Time: You are saving valuable testing and optimization time by giving Google a variety of headlines and descriptions the platform’s machine-learning to find the best performing, most relevant combination. Reach More Potential Shoppers: Responsive Ads’ multiple headlines and descriptions allow you the opportunity to take part in more auctions and match more shopper search queries. Offer You More Flexibility: With search ads that are adapted to devices, you have the potential to reach a variety of customers on a variety of devices in the best way. Now that you know why you should be using RSAs and how to create your first ads, it’s time to look at six Google Responsive Search Ad hacks to ensure maximum success. The most important tip regarding Responsive Search Ads is to do a little preparation before you jump in. You want to find and study your top performing ads in order to find elements you can use for your first campaigns. This includes messaging, headlines, values, offers or any other top-performing elements you can use to create a great set of high-performing headlines and descriptions. Once you have a list of high-performing elements, you can prepare a list of headlines for your RSAs. You want to be sure that you’re not repetitive, or Google won’t show those options. To ensure this, you want to highlight a different offer or product/brand benefit in each of your headlines, while using your top keyword or phrases in at least one of your headlines – but not using them throughout, to avoid them coming off as repetitive. Additionally, you want to try using headlines and descriptions of varying lengths, each with different CTAs. Yes, variety is key. However, you also want to make sure that each of your headlines will work with each of the descriptions. To do this, your headlines and descriptions within each Response Ad should be aimed at one segment. Therefore, you should be creating a Response Ad group for each segment separately. 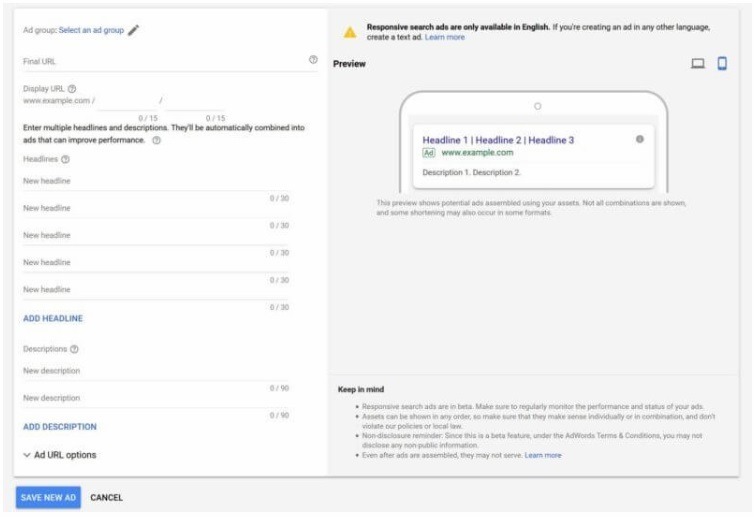 With Responsive Search Ads, Google will test a variety of headlines and descriptions in different positions to find the best-performing message for your potential shopper based on keywords and devices. 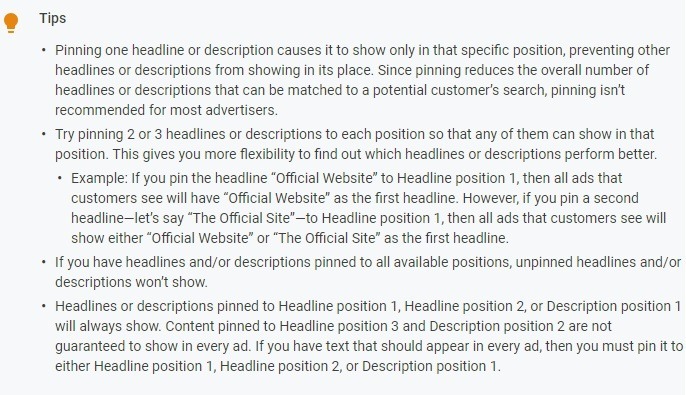 The ability to pin headlines and descriptions allows you to ensure a certain headline or description shows in every combination or in a specific order. This is handy if you have a certain disclaimer, for example, that you need or want in the text of every ad. However, it is important to be aware that for RSAs to be really effective, pinning should be used sparingly and strategically. For every headline you pin, you are restricting Google’s ability to test efficiently, which is the essence of Responsive Search Ad performance. Here are some more of Google’s top pinning tips. Responsive Search Ads can only be added to ad groups with existing text ads while they are still in beta. Furthermore, as Google will try a variety of element combinations within that group, there is no need to have multiple Responsive Ads in one group; this will only slow down optimization. Biz Tips: Basics in Sales & Marketing: Would You Hire a Milkshake?